Servers are some of the most important resources within a network, and the widespread popularity of SQL Servers has made SQL Server monitoring tools a prerequisite for long-term network maintenance. Using a server monitoring tool to track the health of a server can give you the information needed to address performance concerns. In the long term, nipping performance issues in the bud will keep your network up and running. Overlooking the importance of SQL Server monitoring tools can result in performance at best and complete downtime at worst. Overlooking server monitoring can cause a server to go down and cost organizations a lot of money. Utilizing a SQL Server monitoring tool is the only way to safeguard your servers against costly system failure. 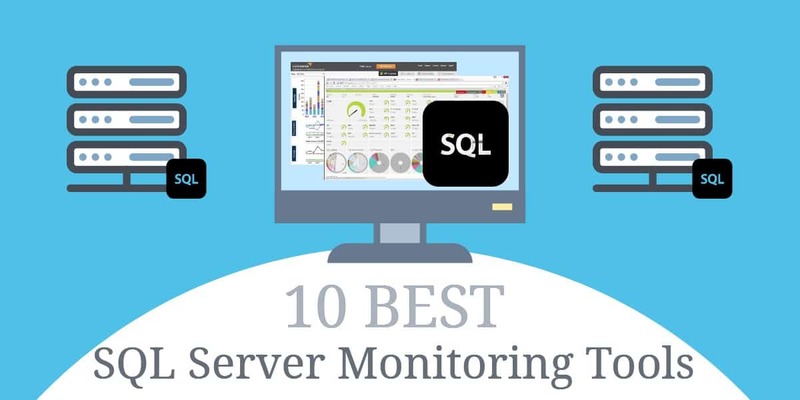 In this article we’re going to look at the best SQL Server Monitoring tools for 2019. SolarWinds Database Performance Analyzer for SQL Server (FREE TRIAL) – This tool for Windows Server monitors SQL Server, MySQL, Oracle, DB2, SAP ASE, and Cloud servers from one centralized location. Paessler SQL monitoring software PRTG (FREE TRIAL) – A network, server, and application monitor that examines monitor Microsoft SQL, Oracle SQL, MySQL, and PostgreSQL performance. Idera SQL Diagnostic Manager – This tool monitors SQL databases in physical and virtual environments including server CPU, memory, hard disk, and network usage. Lepide SQL Server Auditing – A server auditing package for monitoring SQL instances that runs on Windows and Windows Server. SQL Power Tools – Lightweight agentless SQL monitoring solution that covers Oracle SQL Server, Informix, and Sybase database servers. Red-Gate SQL Monitor – This tool has 40 preconfigured alerts to monitor memory resource usage, high CPU, disk space, SQL errors, and query performance issues. dbForge Monitor – Discover CPU utilization, memory utilization, disk activity, and IO latency with this tool. Apex SQL Monitor – This utility monitors transaction running times, buffer cache hit ratio, available memory, processor utilization, page life expectancy, database size, and log growth. SentryOne SQL Sentry – With over 100 alerting conditions, this tool keeps you abreast of SQL server problems. Spiceworks SQL Server Monitoring – Track metrics like SQL Server size, connection, and speed with this tool. When selecting the tools foir this article, we took into consideration the performance and features of each tool, their ease of use, their support and documentation, and robustness in use in a wide aray of industry use cases. SolarWinds Database Performance Analyzer for SQL Server has been designed as a complete server monitoring solution for modern networking. 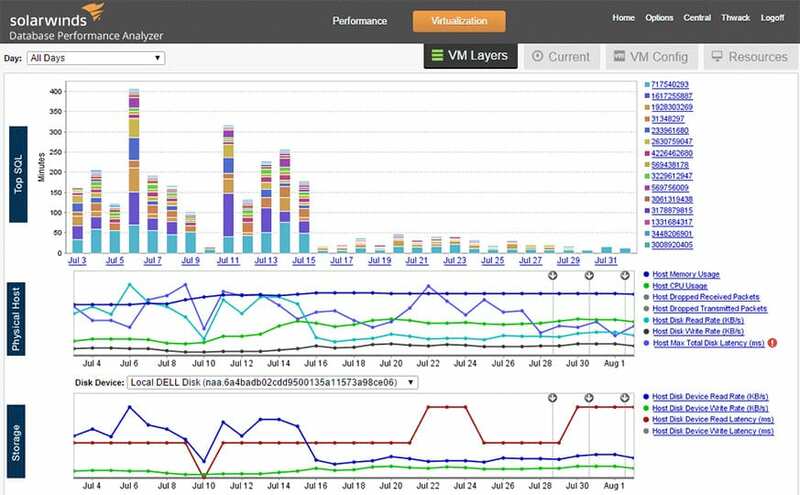 With SolarWinds Database Performance Analyzer for SQL Server you can monitor SQL Server, MySQL, Oracle, DB2, SAP ASE, and Cloud servers from one centralized location. One of the main focuses of this product is finding the root cause of performance faults. The user is provided with a data collection engine to view the raw server usage data. This includes a graph detailing how the performance has changed over time which can be viewed in five unique ways (Summary, CPU, Memory, Disk, and Network). To get to the root cause of performance issues, SolarWinds Database Performance Analyzer for SQL Server allows you to use metrics such as wait times, users, files, and objects to find out what the problem is. What makes SolarWinds Database Performance Analyzer for SQL Server one of the best SQL Server monitoring tools is that it has a low overhead cost on system resources. This means that you can run the program while having a minimal impact on your network performance. SolarWinds Database Performance Analyzer for SQL Server is not only scalable but can also be integrated with other tools like SolarWinds Server and Application Monitor and Storage Resource Monitor, meaning that you can expand the monitoring experience based on your own requirements. 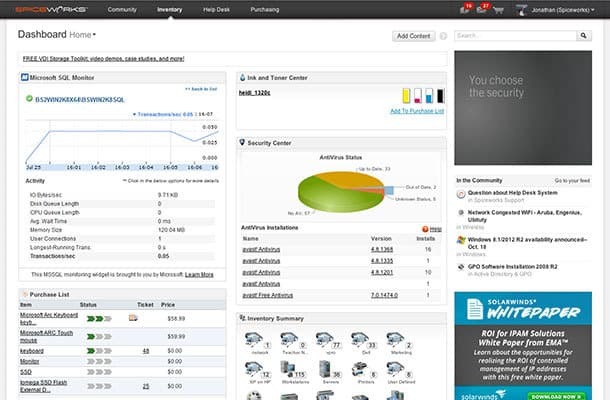 SolarWinds Database Performance Analyzer for SQL Server starts at a price of $1,995 (£1,529). There is also a 14-day free trial. Next up we have Paessler SQL monitoring software PRTG, part of the PRTG suite, a network monitor that also offers a range of SQL monitoring features. With this tool, you can monitor Microsoft SQL, Oracle SQL, MySQL, and PostgreSQL for signs of performance degradation. This process is made simple because Paessler SQL monitoring software PRTG has preconfigured sensor templates for all the most popular databases. Some of the sensors that Pessler SQL monitoring software PRTG comes equipped with out of the box include Microsoft SQL v2 Sensor, Oracle SQL v2 Sensor, MySQL v2 Sensor, PostgreSQL Sensor, and ADO SQL v2 Sensor. Each of these sensors has its own unique view and provides you with the key metrics relating to that individual server. 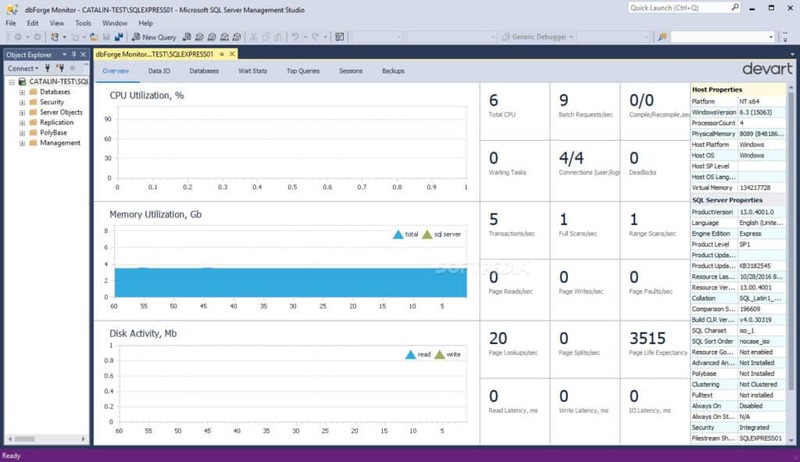 For instance, the Microsoft SQL v2 Sensor tells you the execution time of the request, execution time of the query, number of affected rows, and downtime. Outside of these unique sensor tools, Pessler SQL monitoring software PRTG also has a range of additional features like notifications. You can schedule alerts to determine when you will receive notifications for performance events within your SQL Servers. Once an alert has been triggered you will be sent a notification via email or SMS. If you have the PRTG Network Monitor App on iOS and Android, then you can also receive the alert there. 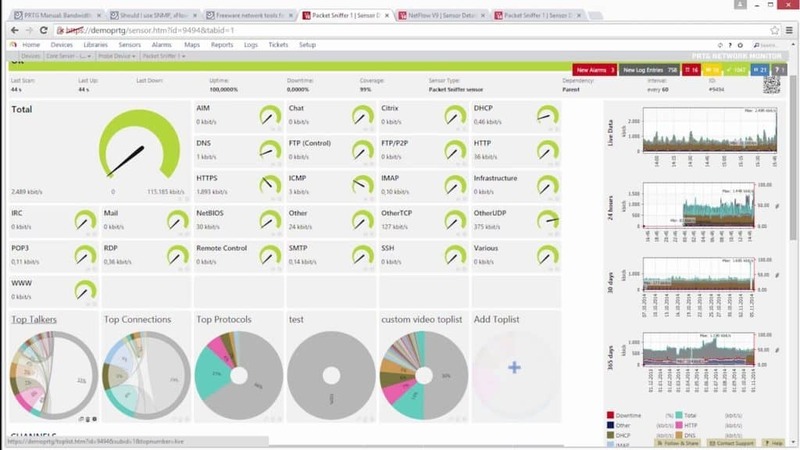 Pessler SQL monitoring software PRTG is one of the best SQL monitors for Windows devices. There is a freeware version of PRTG Network Monitor that lets you monitor up to 100 sensors without cost. From then on the prices range from $2,850-$14,500 (£2,185-£11,117) depending on the number of sensors you want. The cheapest paid version is PRTG 1000 which offers 1000 sensors for $2,850 (£2,185). The largest version is PRTG XL1 which offers unlimited sensors for $14,500 (£11,117). 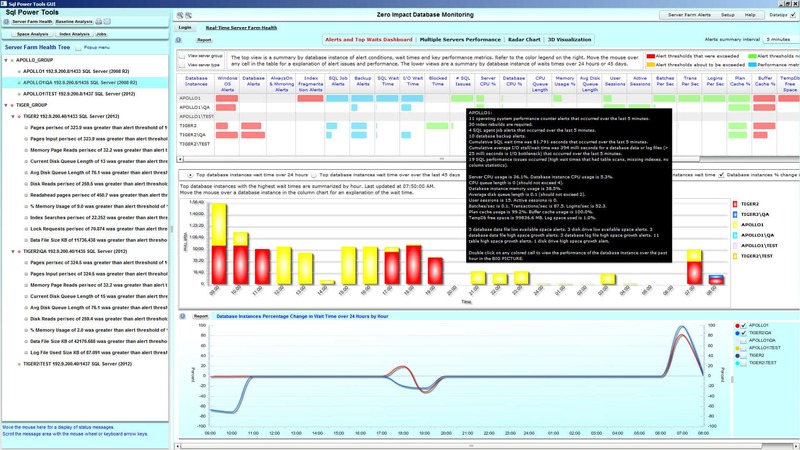 There is also a 30-day free trial of Pessler SQL monitoring software PRTG for evaluation. 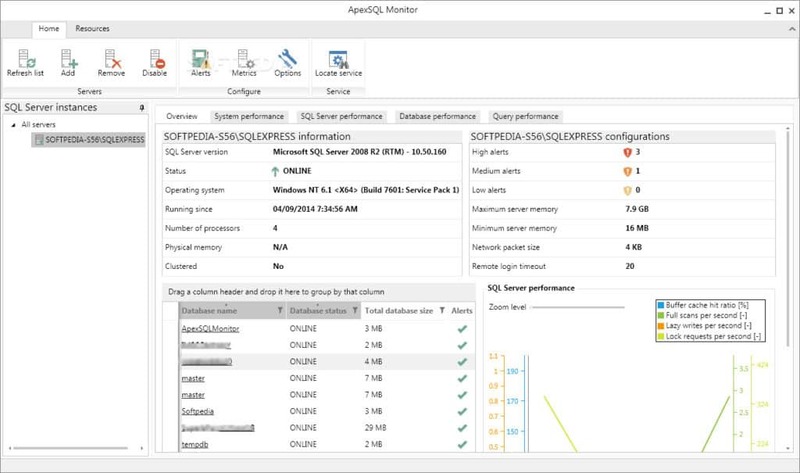 If you’re looking for more of a specialist SQL monitoring software product then Idera SQL Diagnostic Manager is the product for you. 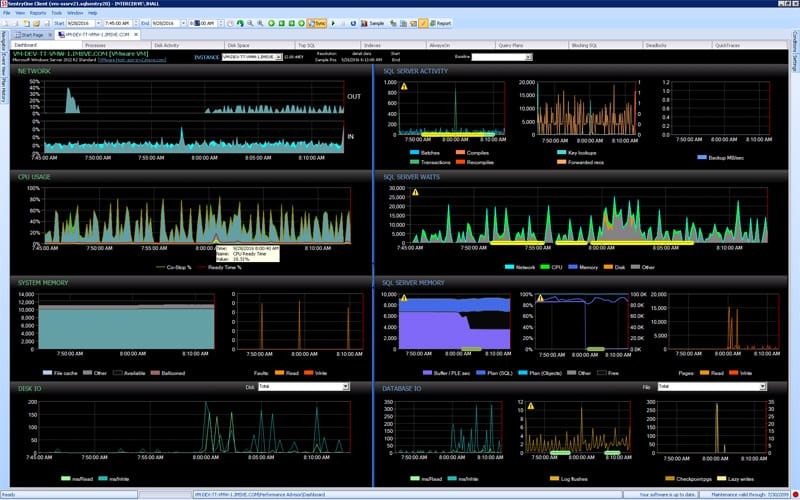 With Idera SQL Diagnostic Manager you can monitor SQL databases in physical and virtual environments. You can view performance information on server CPU, memory, hard disk, and network usage. With this information, you can see if a server is experiencing difficulties. To get the most out of this program, you’re likely to need the SQL Query Tuner add-on. This add-on helps you to discover and diagnose SQL queries that are performing poorly. It does this by creating a graphical representation of the data so that you can see what is going on more clearly. Predictive alerts is one of the most useful features offered by Idera SQL Diagnostic Monitor. You can configure custom thresholds for an alert so that you receive notification once this trigger condition happens. This product also provides you with expert recommendations so that once an issue occurs you can run an automatic script to solve the problem. There is also specific guidance and online content to help you to fix performance issues as they occur. Idera SQL Diagnostic Manager is available for Windows XP, Windows Vista, Windows Server 2008 SP2, Windows 7, Windows Server 2008 R2, Server 2012, Windows 8, Windows 8.1, Server 2012 R2, Windows 10, and Windows Server 2016. You can purchase a single license of Idera SQL Diagnostic Manager for $1,996 (£1,530). There is also a 14-day free trial. Lepide SQL Server Auditing provides a solid server auditing experience for monitoring SQL instances. 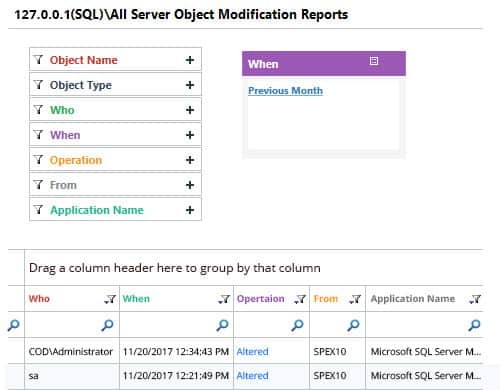 With Lepide SQL Server Auditing all changes made to the configuration of SQL users, permissions, triggers, databases, and logins are saved as audit data. This is great for tracking how SQL configurations change over time and keeping on top of what is going on. 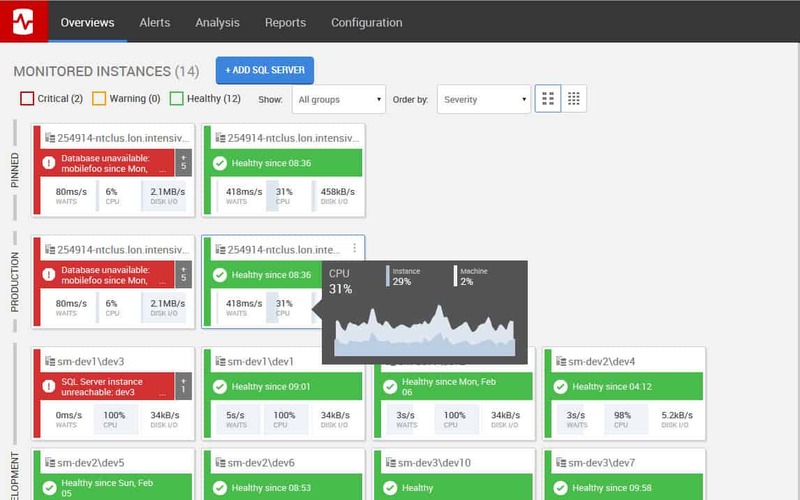 The Lepide SQL Server Auditing platform also allows you to monitor the health of connected SQL Servers. Lepide SQL Server Auditing monitors servers and provides you with data on usage, CPU usage, connections, and error rates. If a server goes down then you will be notified by an alert. Alerts are sent as console updates, emails, and push notifications from the LepideAuditor App. You can download Lepide SQL Server Auditing on Windows 7, Windows 8, Windows 8.1, Windows 10, Windows Server 2008, Windows Server 2008 R2, Windows Server 2012, Windows Server 2012 R2, and Windows Server 2016. If you want to know the price of Lepide SQL Server Monitoring then you’ll need to contact the sales team directly. Lepide also a free trial of this software. SQL Power Tools is an agentless SQL monitoring solution that is dedicated to being as lightweight as possible. With SQL Power Tools you can monitor Oracle SQL Server, Informix, and Sybase database servers with minimal impact on your server resources. Impact is kept to a minimum because the software uses packet sniffing to analyze the performance of the server. The data utilized by SQL Power Tools includes response time, destination IP, source IP application, start time, end time, database, rows returned, bytes sent, and packets sent. This is a sizeable body of data that gives you everything you need to scrutinize a database’s performance. One of the key areas that SQL Power Tools focuses on is cybersecurity. This tool has been designed to prevent cyber attacks with Advanced SQL Behavioral Analysis and User Entity Behavior Analytics (UEBA). When an attacker tries to breach your network these two will recognize the threat and stop it immediately. This makes SQL Power Tools a good solution for securing your servers as much as monitoring them. Overall SQL Power Tools is a product that should be considered by any organization that wants to combine a performance monitoring solution with additional cybersecurity capabilities on Windows. In order to view the price of SQL Power Tools you’ll need to contact the sales team directly. You can request a free trial. Red-Gate SQL Monitor is an SQL monitoring solution that offers one of the most modern monitoring experiences on this list. Red-Gate SQL Monitor gives you a Global Overview that allows you to view the health of connected servers from one window. This view shows a color-coded display of server health throughout your network. In the event that a server is down, it will turn red with a fault message. Fault messages include a notification like “Long-running query. sharepoint since 4:22”. Red-Gate recognizes that even with this Global view it is difficult to keep track of a live network which is why they have their own alerts system. The alerts system comes with 40 preconfigured alerts and can also be customized to send you alerts once a certain threshold has been exceeded. You can set thresholds for memory resource usage, high CPU, disk space, SQL errors, and query performance issues. One of the most noticeable things about this product is how clear and pristine the graphs and visual displays are. They make it easy to monitor your server health promptly. There is also a reporting module which you can use to further breakdown your data for future analysis. You can export reports to PDF and schedule them to be emailed to you in the future. In organizations where top-down visibility over lots of different servers is vital, Red-Gate SQL Monitor is an excellent choice. The Global view will provide you with that core dashboard monitoring experience that keeps you on top of everything going on. You need to request a quote from the company website to view the price. You can evaluate their software on a 14-day free trial. dbForge Monitor is an SQL monitoring tool for Windows that delivers a simple and contemporary SQL monitoring experience. dbForge Monitor absolutely nails the top-down perspective required by a larger network with a dedicated Overview tab. In the Overview tab, you can view key metrics like CPU utilization, memory utilization, disc activity, and IO latency. If you would like to delve deeper into the read and writes for individual database files then you can use the IO Data tab. Through the IO Data tab, you can view total data reads and writes, latency, and input/output operation count. Similarly, the Wait Stats tab is designed specifically to tell you the wait time and waiting tasks to help you pinpoint resources that are adversely affecting server performance. With regards to queries, dbForge Monitor has its own SQL query performance analyzer to keep tabs on resource optimization. The SQL query performance analyzer looks out for resource-intensive queries that overwhelm the system so that it can’t cope with its entire workload. You can view the query text and query profiling data so that you can rewrite it to support your server better. All-in-all, dbForge Monitor is the ideal tool for users who want to view in-depth metrics without relying on too many complex displays. In order to run dbForge Monitor you need Microsoft SQL Server Management Studio 2012, 2014, 2016, or 2017. You also need to have .NET Framework 4.5.2 installed. You can download dbForge Monitor for free. Apex SQL Monitor is an SQL Server monitoring tool that allows you to identify and troubleshoot for poor performance. You can monitor metrics such as longest running transactions, buffer cache hit ratio, available memory, processor utilization, page life expectancy, database size, and log growth. This information is shown in small graphs. These can be a little more difficult to use than graphs by other software but they are still passable. Query monitoring is something for which Apex SQL Monitor offers complete support. For instance, you can capture query wait times for individual and blocking queries. You can also view historical query performance to look for areas where performance is particularly poor. The most interesting aspect of Apex SQL Monitor is the ability to create custom metrics. You can create and measure your own custom metrics according to the needs of your monitoring environment. To do this you need to enter the name of your custom metric, a short description, and category, unit, followed by your query text. Apex SQL Monitor operates on a per-instance pricing model. For one instance the price is $499 (£382) but if you purchase two to four then this drops to $399 (£305). Purchasing for five to nine instances becomes $349 (£267) per instance and $299 (£229) when you purchase for 10-19 instances. You can also purchase for 20+ instances but you’ll need to contact the sales team directly. There is also a free trial available for download. SentryOne SQL Sentry is a tool that takes a more classic approach towards SQL monitoring. You can use this tool to view performance metrics of servers connected to your network and to look closer at poorly-performing queries. You can also discover storage and resource bottlenecks. With SentryOne block analysis you can view blocking processes from a hierarchical perspective so you can find the root cause faster. SentryOne SQL Sentry helps you to stay ahead of the curve with over 100 alerting conditions. You can customize alert messages to display the exact information you want. This is a simple process as well because all you need to do is go to the Condition pane and select the condition you want to customize, then click Message tab > Edit. All messages are XML-based. 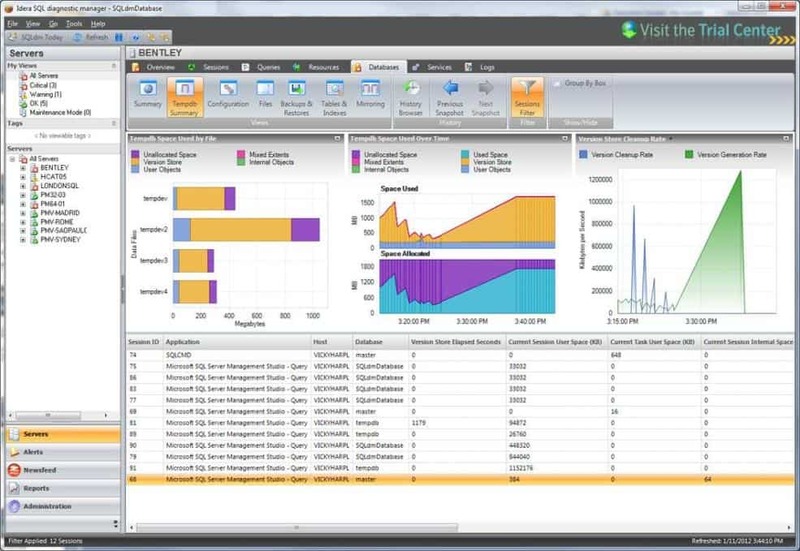 You can purchase SentryOne SQL Sentry as a License and a Subscription. The License can be purchased for a price of $2,495 (£1,912) and the subscription can be purchased for a price of $125 (£95.80) per month. There is also a free trial of SentryOne SQL Sentry available on their site. Spiceworks SQL Server Monitoring is a free server monitoring tool that is popular among smaller enterprises. WIth Spiceworks SQL Server Monitoring you can track metrics like SQL Server size, connection, and speed. If you’re looking to monitor the health of connected servers then you need to look no further than this platform. The dashboard is completely customizable and you can create widgets to monitor the exact infrastructure you want. Once data has been pulled from a server it can then be viewed in customizable charts and graphs. This is particularly useful for seeing how the performance of a server has changed over time. Monitoring servers over a longer time period allows you to see the signs of performance degradation earlier. Organizations looking for a lightweight but well-designed SQL Server monitoring experience would be hard pressed to go wrong with Spiceworks SQL Server Monitoring. You can download Spiceworks SQL Server Monitoring tool for free. 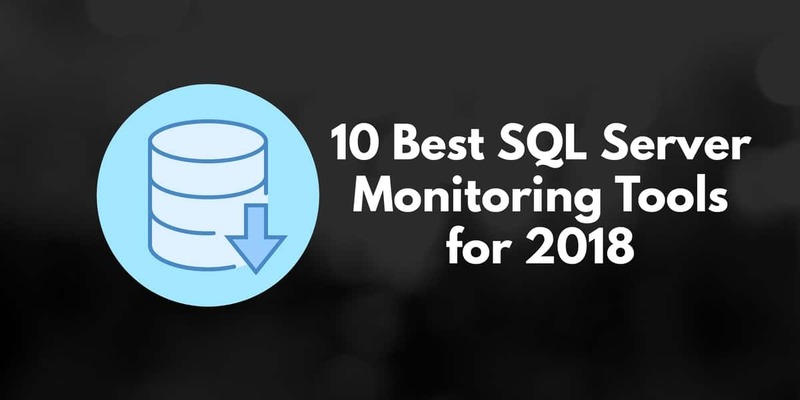 That concludes our look at the best SQL monitoring tools for 2018. Of all the tools mentioned on this list we recommend SolarWinds Database Performance Analyzer for SQL Server and Red-Gate SQL Monitor. Each of these tools offers a server health monitoring experience that can function well within any size environment. The autodiscovery feature of the former makes this a particularly simple process. No matter what your preferences are, we recommend that you try out a number of free trials before you make a purchase. If you’re working within a small network then it is ideal to try out a tool like Paessler SQL monitoring software PRTG on account of its freeware version. The most important thing is to find a product that you’re comfortable monitoring with before you make a purchase. At the end of the day, your comfort with the program will determine how effective it will be when you use it on a daily basis.